HAPPY NEW YEAR! This is the first of the year; the time we give ourselves the opportunity to look to NEW BEGINNINGS! That’s right! It’s “starting over” time! And to signify the start up for 2016, here is an amazing project for you and your household—or even you and your coworkers or church family. Yes, I know the year is well on its way but I wanted to share my excitement which was sparked by the picture on the left that I received by text message. 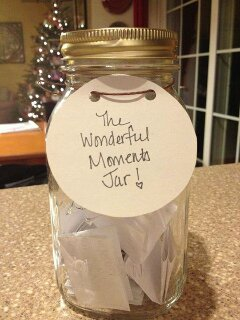 I want you to record wonderful moments of 2016 and then place the notes in the jar. I’ll give you a few examples. For the son or daughter who does well on a given day at school, write a Wonderful Moment Note. My teacher said I did well in class today, in front of the whole class! Name, Jan. 23. A small business owner may make a call to a potential client that results in an opportunity to submit a competitive proposal. A teenager may save up enough money for new soccer equipment. A co-worker may suggest the perfect way to style your natural hair. Or a couple may have a great date night experience. Record it, why don’t you? Remember to include the date. This will add to the excitement of reviewing. Now, what do you think this will do for your positive thinking and expectations for your success in 2016? I’ll tell you what it will do! You will begin to think and speak that no weapon formed against you will prosper! Additionally, you will begin to expect more “wonderful moments,” and more wonderful moments will come. You will also begin to appreciate the small things that make life wonderful. You will notice that your healthy “in look” is helping to generate a healthy “outlook”. Your jar will become more priceless as it helps you—and your family—get over the hump of a disappointing day, AND you begin to become more and more uplifted as you recognize even the small things that make up for wonderful moments. Get your jar, label it and start writing down the moments and placing them in your jar. Go ahead, you are already weeks behind! Imagine opening your jar and finding that in some weeks, there were recordings of exciting times practically daily for an entire week! Go on and do it. Next year, your wonderful moments jar will be a top priority because of what 2016 was like! Do this for your future, in this present moment! You can’t imagine how glad you will be at the end of NEXT year!